This very handsome cast-iron structure was erected in 1887 as the Hugh O'Neill Dry Goods Building and is one of the highlights of the city's "Ladies Mile" retail stretch along the Avenue of the Americas south of 23rd Street that flourished at the end of the 19th Century. Designed by Mortimer C. Merritt, it originally had tall, beehive-style domes atop the almost cylindrical towers at the corners of 20th and 21st Streets. The domes were eventually removed but its conversion to 49 condominium apartments, completed in 2007, included their restoration. The building's name is emblazoned in relief on its pediment. It is the oldest and most handsome of the major department store buildings along Ladies' Mile and was complemented in scale and grandeur by the Siegel-Cooper Dry Goods Store at 616-632 Avenue of the Americas, which was designed by DeLemos & Cordes and erected in 1897, and by the Simpson Crawford & Simpson dry goods store at 641 Avenue of the Americas, which was designed by William H. Hume & Son and erected in 1900. This building has a five-story base topped by a one-story pediment story in the center of the frontage along the avenue. 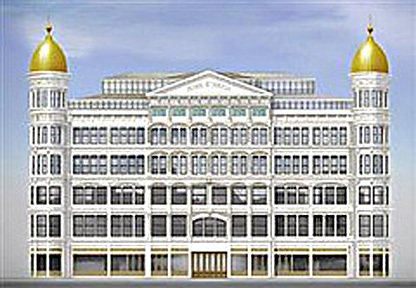 In an article in The New York Times, Christopher Gray noted that the building originally had four floors and that the fifth story was added in 1895, adding that "in 1906, the O'Neill store merged with Adams Dry Goods, a one-time competitor on the block to the north....But the merged company closed in 1907, as garment-manufacturing firms invaded the side streets and drove out retail patronage." "By the 1920s all the giant stories had been converted to lofts and manufacturing. A 1940's photograph shows the old O'Neill store occupied by the Central Time Clock Company, a machinery exchange and similar businesses. By that time, the domes had been demolished," Mr. Gray wrote. The condo conversion by Miki Naftali of Elad Properties included a two-story roof addition and was designed by Cetra/Ruddy and the plan was approved by the city's Landmarks Preservation Commission as the building falls within the Ladies' Mile Historic District, which was created in 1989. The property was acquired by Elad in 2003 for about $37 million. The building's façade is highly articulated with Corinthian columns and pilasters and the cast-iron façade was painted white to have the appearance of stone. O'Neill came from Belfast and opened a dry-goods store on Broadway north of Union Square after the Civil War and in 1870 moved his store to its present location, eight years before the elevated train appeared on the avenue. Demolition of the "El" began in 1938. His new store occupied several modest buildings on the site that he had painted yellow with black lines and brown trimmings, according to Mr. Gray. The restoration of the domes pleased many preservationists but their large bulbous forms in fact are more quaint than beautiful and the domeless building had a very appealing and modern affect. One could almost compare it to the purity and strength and good design of projects by architect Richard Meier. The lower three floors of the building have taller and broader windows than those on the higher floors. The addition of two penthouse floors, setback from the street wall, to the existing building results from a zoning lot merger and easement agreement with the Congregation of Shearith Israel, the owners of the Shearith Israel Cemetery on 21st Street. The building is across the avenue from the landmarked Church of the Holy Communion complex, which is occupied by a nightclub. This neighborhood is convenient to Greenwich Village, Chelsea, and the Flatiron District and abounds in restaurants. The area has undergone significant upgrading and several new residential towers have sprouted above 23rd Street in the former flower district along the avenue. The area has good public transportation.